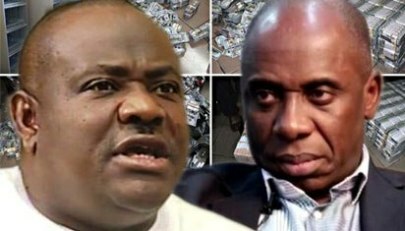 The Rivers State Governor, Nyesom Ezenwo Wike has called on the current Minister of Transportation, Chibuike Rotimi Amaechi to join hands with him to develop the state. In a state broadcast to mark the landmark Supreme Court Judgment striking out the appeals by Rivers APC on Thursday, Governor Wike said that Rivers State stands to benefit more if all leaders are United. “Although the present politics of acrimony and bitterness may have strayed from the noble path of the past, I still believe that we shall be better of standing and working together for our State and our people. “I therefore appeal to the APC and the Minister of Transportation to join hands with us to move our dear State forward. We cannot as leaders continue to remain divided and expect Government to deliver on its responsibilities to our people. Let us from henceforth seek the common ground instead of allowing our differences to be exploited to slowpoke our march to progress. ”Few hours ago, the Supreme Court of Nigeria struck out the consolidated appeals of the All Progressives Congress (APC) and Tonye Cole for lacking in merits. “With this decision, all legal issues regarding the fielding of candidates by the APC for the 2019 National Assembly, Governorship and State House of Assembly elections in Rivers State have finally and permanently been put to rest. What this further means is that the victory of the Peoples Democratic Party (PDP) and its candidates in the 2019 National Assembly, Governorship and State House of Assembly elections is legally safe, secured and protected. ” Let me also express my deepest gratitude to the people of Rivers State for the opportunity to serve you as your Governor for another four years. I am truly humbled by your continued trust and, I will not take this support for granted. ”For me, the collective interest of the people of Rivers State is the reason I am in politics. When you gave me the mandate about four years ago, I committed myself to be the Governor for all the people of Rivers State and stayed through to that commitment”.